What Is a PPS File? A file with the PPS file extension is a Microsoft PowerPoint 97-2003 Slide Show file. Newer versions of PowerPoint use the updated PPSX format in place of PPS. These files contain different pages called slides that can contain video, audio, text, animations, images and other items. 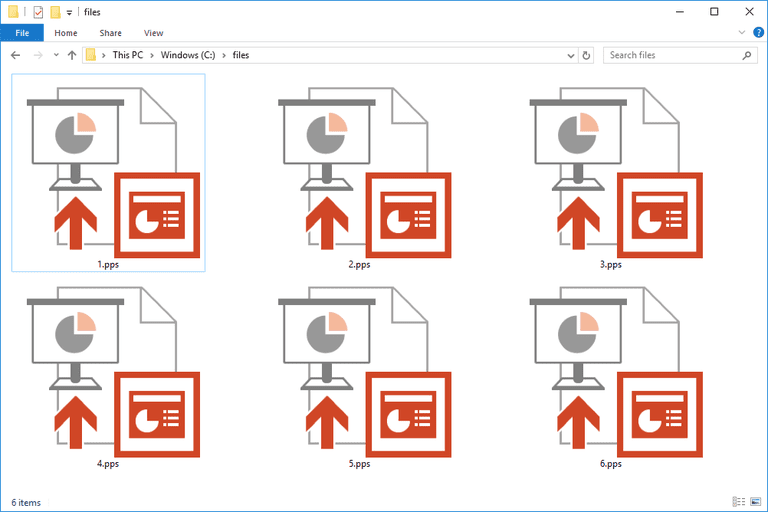 Apart from one exception, they're identical to PowerPoint's PPT files - the difference is that PPS files open directly to the presentation instead of to the editing mode. PPS is also an abbreviation for lots of different terms that have nothing to do with the Slide Show file format, like packets per second, precise positioning service, and pre-paid system. Most PPS files you'll find were probably created by Microsoft PowerPoint and can of course be opened and edited with that program. You can also open and print (but not edit) PPS files without using PowerPoint with Microsoft's free PowerPoint Viewer. Since PPS files are used by PowerPoint to immediately begin a presentation, opening one by regular means will not let you edit the file. To make changes, you must drag and drop the PPS file onto an empty PowerPoint window or open PowerPoint first and then browse for the PPS file from within the program. A number of free programs will also open and edit PPS files, including OpenOffice Impress, Kingsoft Presentation, and probably other free presentation software programs and free Microsoft Office alternatives. If you find that an application on your PC does try to open the PPS file but it's the wrong application or if you would rather have another installed program open PPS files, change the default program in Windows. To convert a PPS file to another format using PowerPoint, just open the file and then save it to some other format like PPT, PPSX, PPTX, etc. The other PPS editors mentioned can convert the file, too. One example of an online PPS converter is Zamzar, which can save files of this format to PDF, JPG, PNG, RTF, SWF, GIF, DOCX, BMP, and several other file formats. Online-Convert.com is another PPS converter that supports converting PPS to video formats like MP4, WMV, MOV, 3GP, and others. PowerPoint can convert PPS to MP4 or WMV too, through its File > Export > Create a Video menu. PPS files that have been converted to a video format can then be converted to an ISO file or burned directly to a DVD with Freemake Video Converter, and probably some other video converters. If you want to convert a PPS file to use it with Google Slides, you have to first upload the file to your Google Drive account. Then, right-click or press and hold on the PPS file in Google Drive to get a context menu - pick Open with > Google Slides to convert the PPS file. In some contexts, PPS stands for packets per second. If you're looking for a PPS to Mbps (or Kbps, Gbps, etc.) converter, see this one at CCIEvault. What's a BBS File and How Do You Open One? What's an INDD File and How Do You Open One? What's an RTF File and How Do You Open One? What's a POTX File and How Do You Open One?